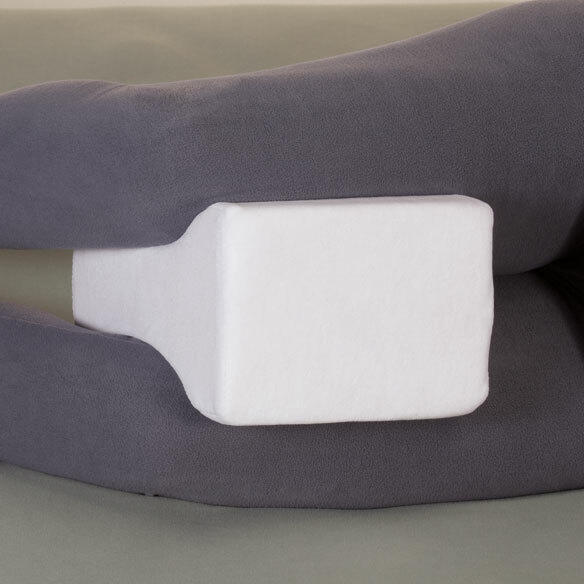 Specially designed memory foam leg pillow supports legs for maximum comfort while lying down. Memory foam core responds to body heat and pressure, molding to your unique leg contours and reducing pressure on your back, hips and knees. Plush, removable pillowcase is soft against skin. Firm-density foam in a lightweight design. 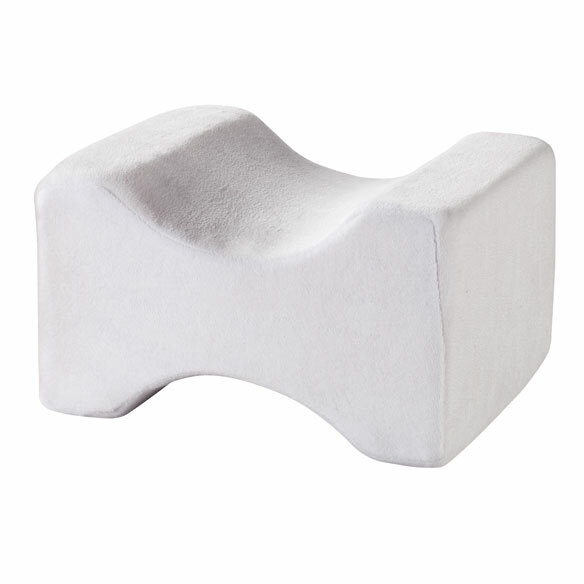 Contour leg pillow returns to original shape when not in use. 9 1/2”L x 8”W x 5 1/2”H. This really helps my knee pain at night. Excellent!! Helps my back problem. My back feels better since I've used the support so I'm very pleased with it. Having low back issues. Hopeing the cushioning between the knees will help with the problem while I am sleeping. Help keep everything in line and pain free. Have chronic back and hip pain. This helps me sleep better. Have chronic back pain and am a side sleeper. good alignment for sleeping hoping to help back issues. Knee pain when I sleep. I've been using a pillow to support my legs and this looks much better that the cylindrical pillow I've been using. It makes a Difference in sleeping at night. I have always wanted to get a pillow to put between my legs but never did. So because of the product from Easy Comforts has a great price and it's made with memory foam. When viewing the catalog, thought it would work better than a pillow. Very anxious to try it. Looks very sturdy, my last one didn't last long, so this looks like one that lasted me for years! Was told by a friend that this would help my backaches. We shall see. To assist with alignment while sleeping. My neighbor has one of these pillows and says it is great. been looking and waiting for this item in the barrage of catalogs. For my Mother who has restless leg syndrome and is always placing a pillow between her legs to sleep in order to reduce her leg symptoms. This is excellent to keep a bedridden patient's heel off the bed. It works perfect. Leg pain from the weight of one leg on the other. this type of pillow prevents the pain. I bought one years ago and love it. I like the shape and that it has a cotton cover. Don't have it yet though. I have back problems and this pillow may help relieve pain. If you are a side sleeper, this pillow is vital for a good night's sleep. I use it all of the time, and always take it with me when we travel! To help support my knees when I sleep at night.